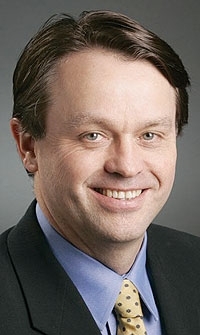 Brent Dewar is one of four former GM Europe executives to get a top job in the new GM. DETROIT -- Brent Dewar General Motors Europe's vice president of sales, marketing and aftersales, was named head of Chevrolet on Thursday as part of a leadership shake-up at the four surviving U.S. brands that make up the new General Motors Co.
Former GM Europe design boss Bryan Nesbitt, the currently chief of GMs North American design, is the new head of Cadillac. Both changes take effect Aug. 1. Dewar, 54, and Nesbitt, 40, are the latest in a long line of GM Europe executives to be called back to Detroit. The others include CEO Fritz Henderson and new marketing chief Bob Lutz. Both served as head of GM Europe within the last six years. Dewar and Nesbitt will report to Lutz, 77. It is likely that more top managers will leave GM Europe as parent GM gets ready to give up control of German unit Opel and its U.K. sister brand Vauxhall. Dewar, a 31-year GM veteran, has been in charge of European sales and marketing since June 2008. Prior to that he was North American vice president of field sales, service and parts. He began his GM career with GM of Canada in 1978 and came to the United States 10 years later as manager of strategic planning for Chevrolet. He held several field positions with the brand before GM named him executive director of sales, service and marketing in Brazil. Two years later he returned to the United States as general manager of GMs Northeast region. In March 2003 he became Chevrolets general marketing manager, helping launch 10 products within 20 months. He also was in charge of Chevys Chevrolet: An American Revolution ad campaign. Dewar became North American vice president of marketing and advertising in 2005. Buick, GMC, Chevrolet and Cadillac remain part of GM following its U.S.-guided restructuring through bankruptcy. Saab, Hummer and Saturn are being sold, and Pontiac will be phased out next year. Nesbitt, known for styling Chryslers PT Cruiser, has spent eight years at GM. Before taking the North American post in June 2007, he was executive director of design for GM Europe. Nesbitt came to GM in 2001 from Chrysler, where he worked with Lutz. He later crafted GMs version of the PT Cruiser retro wagon, Chevrolets HHR. Susan Docherty, 46, starts as general manager of the Buick and GMC brands on Aug. 1. Docherty, who currently is North America vice president for the brands, also will report to Lutz. Jonathan Browning, 50, who is GM vice president of global sales, service and marketing, will leave the company on Oct. 1 to pursue other interests. He will not be replaced.